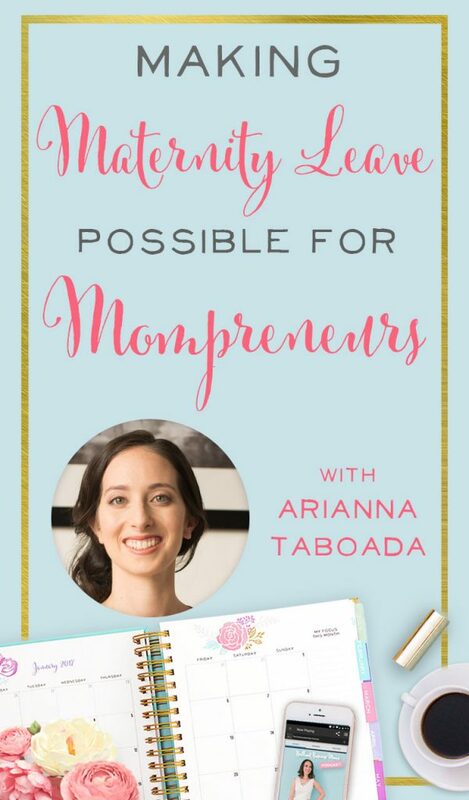 Arianna’s job description is fancy–Maternal Health Consultant for Entrepreneurs–but what it means is she most often works with first-time mamas-to-be who are entrepreneurs to help them create a smooth maternity leave plan that keeps their businesses thriving while their families grow. At this time of recording I was heavily pregnant, so of course talking with Arianna was incredibly timely and very helpful for me! And I know many of you out there have established businesses, but are thinking of adding more babies to your family. You’ll love what Arianna has to say. Welcome to the show, Arianna! 6:57 – Arianna’s Advice For Me? 10:27 – How Long Do Moms Take Off From Work? 14:05 – Real Talk: How Can You Prevent Postpartum Depression? Interestingly, Arianna started her maternity leave planning and coaching career before becoming a mom. I was so curious to hear how this business started for her and how she got into such a unique field. Arianna’s Masters in Social Work has an emphasis in Maternal and Child Health, which she admits is a unique field! In fact, there are only a few programs left in the states focusing on supporting women, children, and families during this special, challenging, and always a bit uncertain time. She started out working in outpatient settings, like small health centers and federally qualified health centers. She worked in what’s known as the “Safety Net System,” focusing on women who were very vulnerable, experiencing such things as homelessness and domestic violence. She began to realize that she was able to help these women navigate the pressures of caring for a family with tons of other pressures demanding their time, attention, and focus. What did it look like for Arianna to move away from clinical care and towards getting private clients? She was prompted, as many business owners are, by a life transition. In 2012 her family moved away from their home in North Carolina to Mexico, where she lives now. But she loved the work she was doing and wanted to continue doing it! Once settled in her new home, she rented out space in a psychotherapy center. Arianna took the more formal model of counseling she was used to and adapted it to her new environment. This is also around the time Arianna began providing support via the Internet, which opened doors to reach even more moms. The first iteration of her practice was focused on postpartum health. A lot of Arianna’s early clients happened to be self-employed women and small business owners. This question of how to have a baby and get back to work” seemed to be recurring. It wasn’t long before Arianna realized that providing support and counseling in the postpartum stage was often too late, especially for the mamas planning to go back to work. 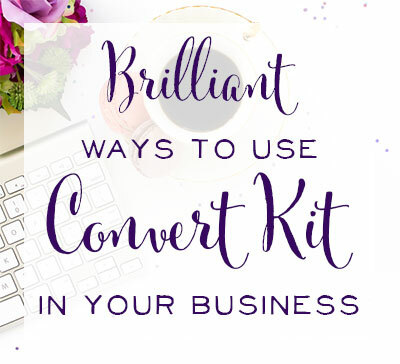 She could better meet the needs of her clients if she started earlier in the process. 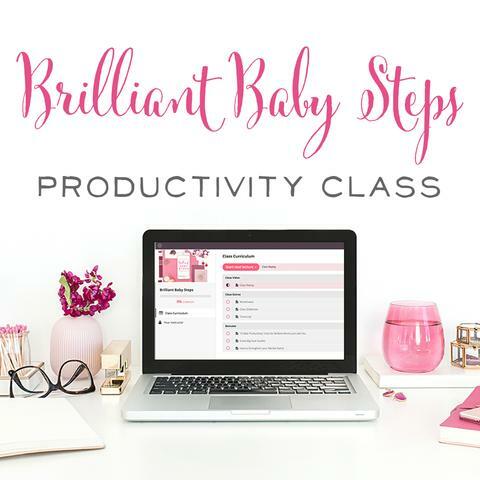 About 18 months ago, she shifted her business focus from postpartum to planning ahead for maternity leave and taking steps for that successful reintegration into work life. Being 34 weeks pregnant at the time of this recording, I’m obviously Arianna’s ideal customer! I was already a mom before getting pregnant, but we have been far removed from the baby days! My son is in all-day kindergarten, and all of the sudden we’re going to have a newborn! 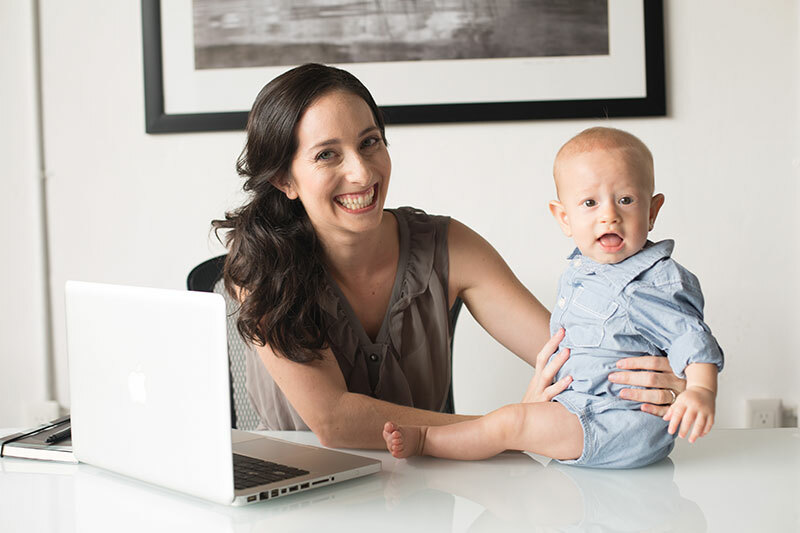 I do want to have a maternity leave from my business, so what advice does Arianna have? Arianna really encourages business owners to use the flexibility we have with our jobs to make gentle transitions. In an office setting, a mom might work full-time right up until the day she has her baby, take 6 weeks of zero work, then plunge right back into working 40 hours a week. Arianna really encourages being aware of timing and thinks a more gradual transition is optimal. 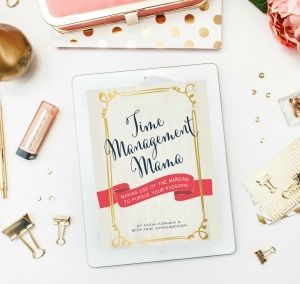 A better option is to make a hard and fast deadline, such as 37 weeks when a mom is full-term, to hand-off everything that would normally be on your plate. Yes, 100%! Don’t put off this handing-over until 40 or even 42 weeks. Try to honor the earliest deadline possible to give yourself space. The other half is to think of the transition time back. Even if you’ve had a newborn before, babies can have different temperaments. And juggling more than one kid can be a whole new challenge. 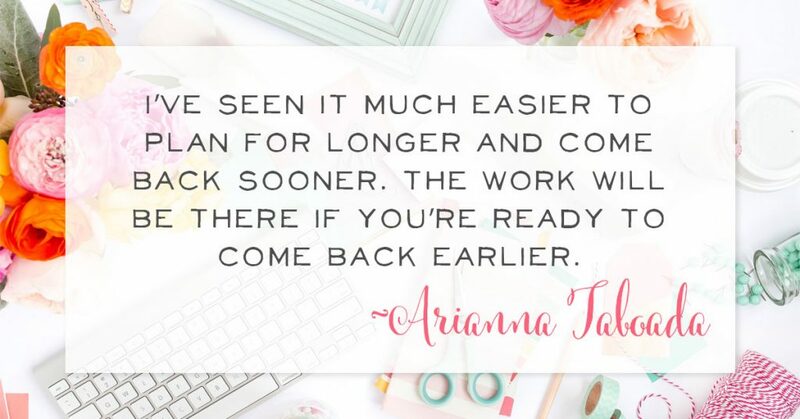 Arianna suggests that her clients utilize a 2-3 week period of time when you’re getting back into work. Dedicate those weeks solely to finding your new groove and workflow. Don’t dive 100% back into a major project! Give yourself time to figure out childcare logistics, or how to get your older child settled, and figure out when your new one will be napping and eating. Setting up your new routine is a total learning opportunity and a great experiment. How Long Do Moms Take Off From Work? So, in preparing for Baby Boy Schwamberger to arrive, I’ve planned to take 2-3 months totally off from work. But I’ve heard from so many of my mom entrepreneur friends that my plan sounds great, but I’ll have tons of ideas while I'm feeding the baby in the middle of the night and I won’t want to stay away that long. What patterns has Arianna seen? Are there women who do themselves a disservice trying to sneak work back in soon? Or women who take a long, long time off and find that they’re unfulfilled? Real Talk: How Can You Prevent Postpartum Depression? Call it hormones or whatever, but I had to get real and ask Arianna about one of my greatest new mommy fears. So brace yourself for some real talk. One of my biggest fears is suffering from postpartum depression. One thing you might not know about me is that my first child is adopted, so he did not come home until he was 2.5 years old. I haven’t done the birth/baby thing before! And I’m totally freaked out about suffering from postpartum depression. So my big question is this: Are there any tips to prevent postpartum depression? First, let’s clarify terms. Postpartum depression is part of a broader category, Perinatal Mood Disorders, which include depression and anxiety, and these symptoms can come up anytime during pregnancy and postpartum. First, look up the Maternal Mental Health Professionals in your area you could go to if it turned out that you had a mental health issue. Second, look for distinctions in the provider’s bio that describe them as being trained specifically in the field of maternal mental health. In the mental health field, you’ll want to look up folks in your area who are specifically trained to support moms. Arianna made it a point to say that seeking in-person treatment is really the most effective way to handle Perinatal Mood Disorders. Whether in one-on-one counseling, psychotherapy, or group model sessions. One of the biggest risk factors for PPD is isolation. You can take steps to prevent yourself from being isolated during the postpartum time. Isolation can be especially prevalent for online business owners, because of the nature of virtual work. Especially if you’re aware that you have an element of isolation in your life, seek out activities to do during the postpartum phase that require you to get out of the house. Arianna says go so far as to list out those activities such as a new moms groups or a park to walk in; literally, list out places you could go with your new baby to prevent being isolated. Deep breath. Did that advice help calm your fears? I know it did mine. It sounds like being prepared and listing out your plan ahead a time is key. I’m just sitting here, picturing myself with a new baby, knowing I”ll be too exhausted and too stressed to go look up mental health pros online or finding a new support group if I need one. But that’s the kind of thing I can do now for myself, I can make an entire doc of resources today that I may need to use tomorrow. I love those ideas! 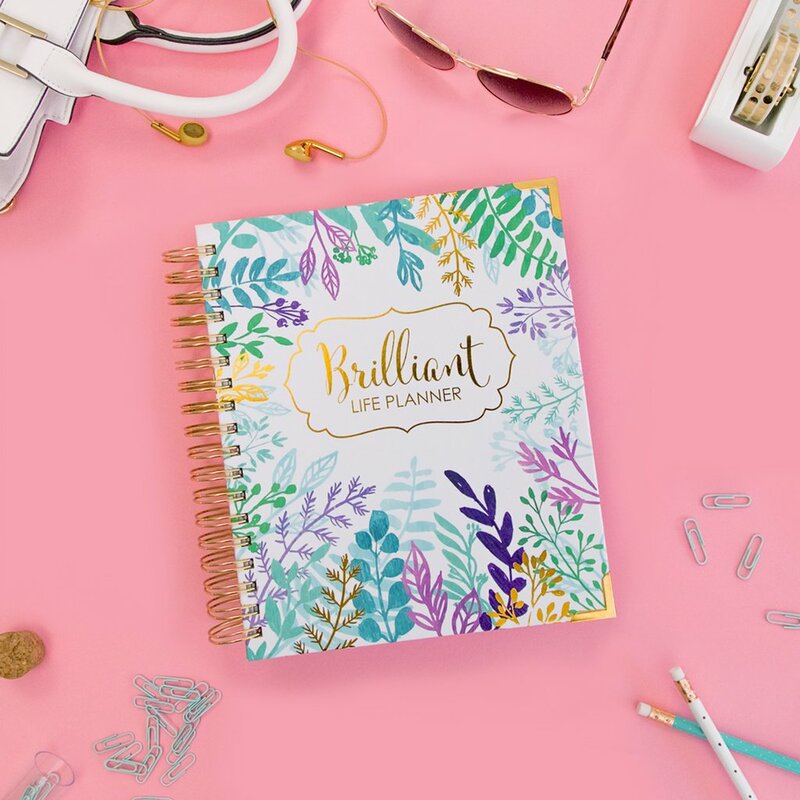 And, yes, I wrote a note in my Brilliant Life Planner as Arianna was talking to get my “Baby Survival and Support” list ready! Another way to categorize all of this helpful information is to use a social work tool called an Ecomap. She made one for her clients, and used one herself when she was planning her own leave! It’s a free resource to visually map out those support networks. And when you have a visual, it’s easier to see the holes, where you’re missing an element. You can download Arianna’s Ecomap that she uses with clients on her site. Shifting gears, I wanted to learn more about Arianna’s business model and how she’s grown it. 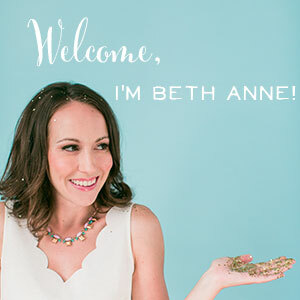 As a consultant, she works with clients one-on-one to help prepare them for this big life change. I wanted to know, how many clients is she able to handle each month? What’s her client lifecycle like? When do they graduate from her services? Arianna says she has really found a sweet spot when she’s able to develop a longer relationship with her clients. She offers a shorter period of services (1 month of work together in 2 sessions to do maternity leave planning) but has found once you do the planning, additional coaching along the way to implement the plan can provide wonderful hand-holding and guidance. A full client lifecycle – from planning through implementation – for Arianna would be about 6 months long. Pre-baby, Arianna kept 3 client slots open each week, so for 3 days each afternoon she booked out her schedule to work with clients. Since getting back to work after her baby, she’s had to reframe that workflow! Arianna still has 3 afternoons available for work, but only works with 3 clients at any given time. She’s scaled back her services to be able to provide the same quality and level of service without burning out. 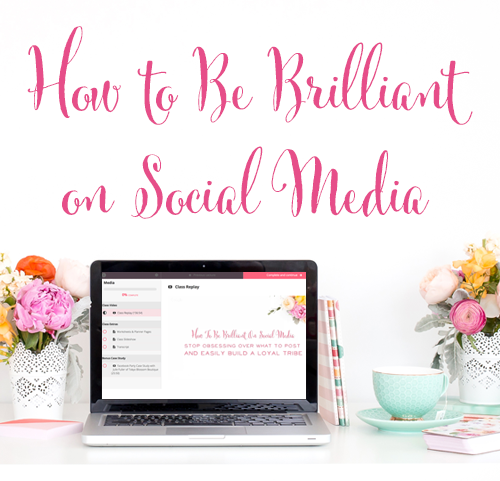 How does Arianna know when she’s ready to graduate clients from her services? Does she make an exit plan for her clients? Or does she trust clients to tell her when they’re ready to fly the coop? Arianna knows herself and her business well. She has identified that the 1-year mark is really the longest that she’s able to deliver her strongest services. Her field is a tricky one because uncertainties of motherhood can be ever-present. For Arianna, a hallmark of having a fantastic client relationship is when the client she’s working with has the skills and tools to step back when the problem arise and can know how to navigate the unknown, deal with uncertainties, and pivot to make new strategies for moving forward. (These soft skills apply in motherhood and business, don’t they!) When she feels the client is confident to move forward and apply the tools individually without direct guidance and support, she knows they’re ready to graduate. Sometimes Arianna recommends that her moms join a business coaching model support group for ongoing help. That’s certainly the right expectation for new moms, isn’t it? Doesn’t that change up things? Her family is getting ready to move houses in about two weeks of the time of this recording and her 11-month-old son has developed a new love of packing materials and suitcases. She said while she and her husband were packing, they lost track of their little boy – who suddenly wasn’t crawling around anymore. They had a parent-panic moment of trying to find the baby, only to realize that he had completely shut himself up in a suitcase! Sounds like this little guy is ready to move! Arianna was kind enough to tease an amazing new project she’s got in the works: 100 Businesses Babyproofed Project. She has a goal, between now and her birthday, to have conversations with 100 entrepreneurs who are expecting or plan to get pregnant in the next year about what it means to take maternity leave and keep themselves and their businesses thriving. We love that goal! Good luck!